Americans flocked to Mackenzie's cause. They included a brandy-loving adventurer and scion of a great New York State family, Rensselaer Van Rensselaer, 35, grand-nephew of General Stephen Van Rensselaer and son of Colonel Solomon Van Rensselaer. (Uncle Stephen saw his army clobbered by a smaller British force at Queenston Heights in the War of 1812, a battle in which papa Solomon received multiple wounds.) Based on his family's losing military history, Mackenzie appointed the younger Van Rensselaer as his chief general. 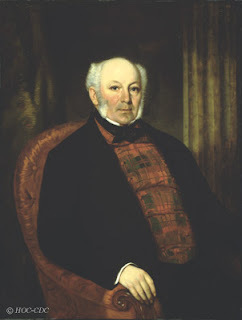 The man defending Canada, Colonel Allan Napier MacNab (one of the British commanders who defeated Mackenzie's rebels in Toronto), took a personal dislike to Mackenzie's cannon barrage. Even though his orders were to just contain Mackenzie, he decided to strike. 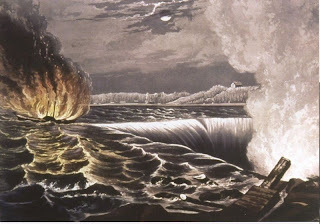 On December 29, Captain Andrew Drew of the Royal Navy, acting under MacNab's orders, rowed across the icy river in darkness with 60 militia and attacked the Patriot's supply ship, the steamship Caroline, at Schlosser, NY. Drew's men towed the ship into the current and set her afire. The blazing ship grounded on rocks and broke apart, her pieces plummeting over the falls. Drew's raiders killed a black American sailor named Amos Durfee. He appears to be the first American casualty of the spreading border war—but not the last. Aside. The attack on the Caroline stands as one of the earliest cases of a preemptive strike by one peaceful nation on another. Americans saw the British attack on an American ship in a US port as an assault on their sovereignty. It did more to boost Mackenzie's support than any of his fiery speeches. While President Martin Van Buren shrugged off the incursion, US citizens sent money and ammunition to Mackenzie. American volunteers soon outnumbered Canadians in the new Patriot army. Burning the Caroline was a rash military act. It turned a bungled revolt near Toronto into an undeclared border war. Seeing a chance to continue his war against Britain, Bill Johnston arrived on Navy Island in early January, bringing with him a nine-pound field cannon, likely liberated from the state arsenal. It was Johnston's first meeting with Mackenzie (who he admired) and Van Rensselaer (who he quickly distrusted). Johnston remained for three days and returned home—briefly. Aside: While on Navy Island, Bill Johnston likely met Canadian refugee Benjamin Lett. Whereas Johnston and his peers largely behaved as principled freedom fighters throughout 1838, Lett developed a reputation as the only true terrorist in the Patriot movement. Due to cold, a sustained British cannon bombardment, and Van Rensselaer's dithering, Patriot fighters slowly deserted Navy Island. On January 13, 1838, Van Rensselaer and his remaining volunteers withdrew from the island. 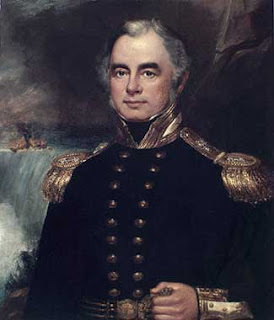 For awhile in early 1838, the British in the Canadian colonies thought Van Rensselaer's retreat meant an end to trouble. Such optimism! Aside: An American jury indicted Captain Drew for murder. He left Canada in 1842, fearing he'd be murdered for the Caroline affair if he stayed. In contrast, MacNab was knighted in 1838 for his defense of Canada. The Dictionary of Canadian Biography includes more on MacNab and Drew.